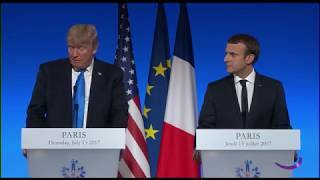 President Donald J. Trump and French President Emmanuel Macron remembered the history of the U.S.-French alliance today, but also looked to its future, pledging to cooperate even more closely in the fight against terrorism. The U.S. and French presidents spoke to the media following meetings at the Hotel des Invalides here. Trump’s visit marks 100 years since U.S. troops arrived in France to fight in World War I. The American president noted that Bastille Day marks one year since a terrorist killed 86 people celebrating the holiday in Nice. He said the anniversary causes the nations “to renew our resolve to stand united against these enemies of humanity, and to strip them of their territory, their funding, their networks and ideological support,” he said. “When it comes to fighting terrorism, from day one, I can say that we've seen eye-to-eye and we are strongly determined to take necessary measures in order to root out terrorism and to eradicate it,” Macron said through a translator. The French president said the two leaders discussed a roadmap for Syria and Iraq post-ISIS, and discussed cooperation against ISIS in Libya. “Be it Libya or the Sahel, I think I can say that we have the same vision, very coherent understanding of the situation in the region, and the same willingness to act very clearly against any form of terrorism and destabilization,” he said. Macron noted the United States is extremely involved in the fight against ISIS in Iraq, and thanked Trump for all that has been accomplished there. “I would like him to know that I am fully determined to act together with him in this respect -- fully determined,” the French president said.